This is one of my favorite summer dishes. A bright, seasonal salad that is super simple to throw together and really refreshing. I wanted to take advantage of the beautiful spring produce which is now appearing in abundance at the grocery store and farmers’ market. With strawberry season in full swing we’ve been gorging ourselves daily on the sweet, juicy berries and can’t quite get enough of them. 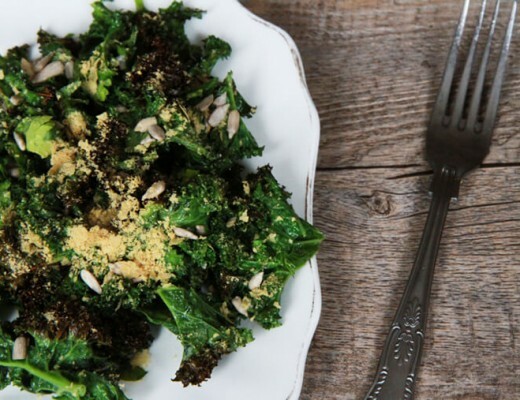 Not only are they summery and delicious, they’re a bona fide superfood, too. Nutrient-rich and packed with antioxidants (like vitamin C), strawberries offer a wide range of health benefits, some of which may surprise you. For starters, strawberries are rich in fiber. Fiber enables digestion to work properly, which is essential for proper immune function. Strawberries are chockfull of antioxidants and other essential nutrients that can flavorfully help you reduce your risk of cancer, heart disease, inflammatory diseases, and birth defects as well as mouthwateringly manage your weight. Spinach is one of the most nutrient-dense foods in existence. 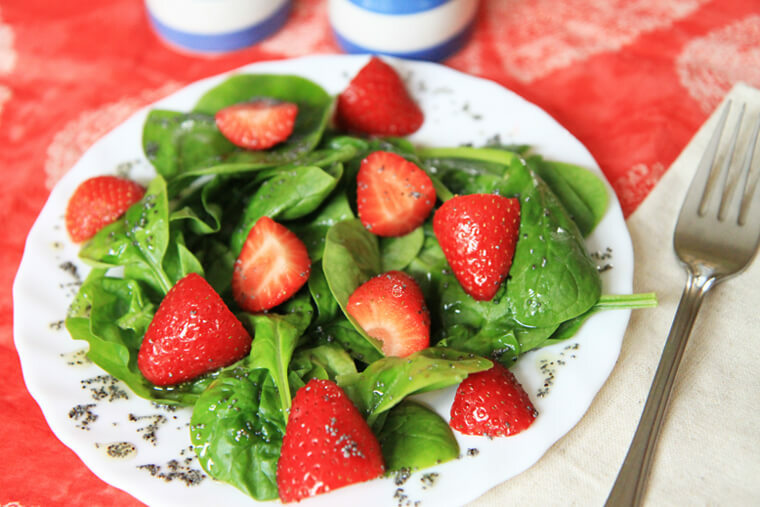 Spinach contains an impressive range of active substances which are indispensable to the body. One cup of the leafy green vegetable contains far more than your daily requirements of vitamin K and vitamin A, almost all the manganese and folate your body needs and nearly 40 percent of your magnesium requirement. It is an excellent source of more than 20 different nutrients, including dietary fiber, calcium and protein. This dark green leaf will protect your brain function from premature aging, promote cardiovascular health and neutralize free radicals in the body. A good rule of thumb: the darker the leaf, the better. Now lets get back to this salad! This recipe may be perfect timing for the weekend. 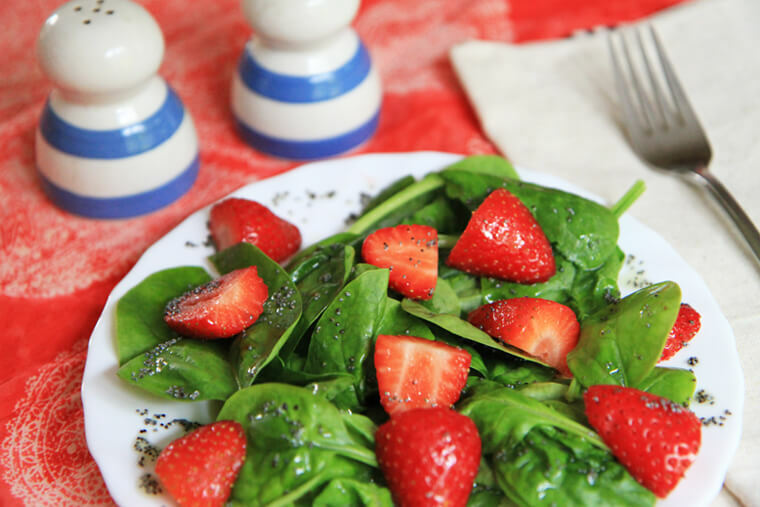 If you can get yourself to a strawberry patch or a local market for some summer berries, you can whip up this simple, refreshing salad. In a bowl combine all ingredients for the dressing. Mix well. Toss the washed and dried salad greens, and plate. Top with fresh strawberries, nuts, and any other add-ons. Drizzle a generous amount of dressing over salad. Serve. 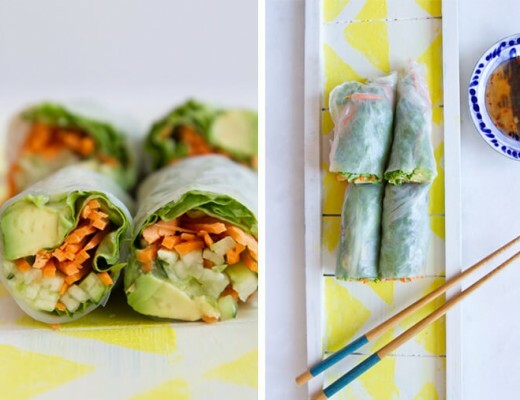 What are some of your favorite things to eat in the summer? Please share them below! Hope you have a fun and exciting weekend. If you have lots of sun where you live, send a little this way as ours is hiding and we could always use a little more.